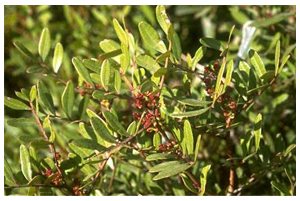 You are at:Home»Herbs»Pistacia lentiscus Linn. Latin name : Pistacia lentiscus Linn. Description : The resin is analgesic, antitussive, astringent, carminative, diuretic, expectorant, hepatic, sedative, a mild stimulant and stomachic and used in catarrh of the respiratory and urinary passage and for the treatment of diarrhoea. It has been used in Greece for centuries as a natural remedy for a broad range of gastrointestinal disorders such as gastritis, gastroesophageal reflux disease (GERD) and many types of intestinal inflammation. It strengthens the stomach, increases appetite and relieves flatulence. Also useful in general and genital debility, as an aphrodisiac, in seminal weakness and sluggish liver. Sweetens the breath. It is a safe and effective alternative to antibiotics in the treatment of stomach and duodenal ulcers and it has been shown to effectively eradicate Helicobacter pylori, which is often implicated as the cause for these G.I. conditions. Unlike antibiotics, mastic gum does not eradicate the friendly bacteria in the intestines, which are important to health. Recommended Dosage : 1 to 2 g resin. Contraindication : The resin has no known warnings or contraindications.